Belfast Mayor Samantha Paradis, center, City Manager Joe Slocum, second from right and Belfast City Councilors at Tuesday night's regular council meeting. 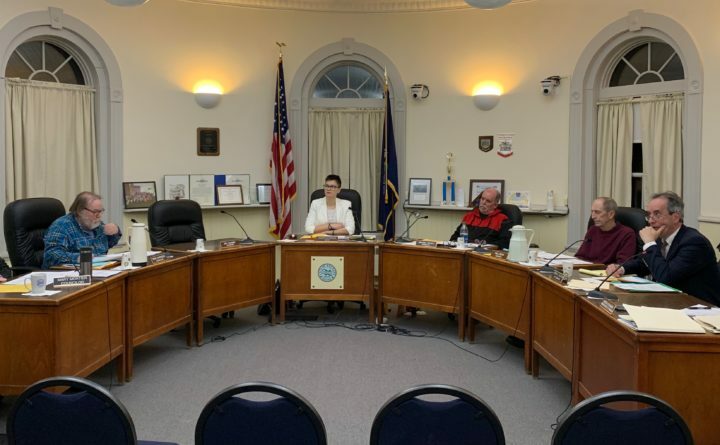 That message came through loud and clear at Tuesday night’s meeting when councilors and Mayor Samantha Paradis debated one single agenda item for about 75 minutes. That fight was to decide whether to adopt procedural rules to better run their meetings. In the end, that’s what the five councilors unanimously voted to do. But not without discussion and strong pushback from Paradis and a handful of Belfast residents who spoke in two open-to-the-public portions of the meeting. City Manager Joe Slocum, who proposed the resolution, previously said that it was not intended to single out anyone in particular. Two drafts submitted to the council both specified the manner in which agenda items would be presented and the order in which discussion on those items would proceed. But Maddie Thompson Crossman, who spoke first during the time for public comment, said that she believed the draft resolutions were intentionally designed to mute Paradis. She ended her remarks by telling councilors she was sure they would say she was overreacting to their actions. “That is called gaslighting,” she said. The procedural rules, and the conversation about adopting them, were the latest chapter in a municipal government soap opera that has turned the meetings, which are live-streamed and televised, into must-watch TV for many and a hot topic around the small city. Problems between councilors and the mayor — who was elected to a two-year term in November 2017 and moderates meetings but only votes to break ties — first came to a head last November. That’s when councilors voted to stop Paradis from speaking on their behalf after she had written a controversial commentary in the Republican Journal that they believed accused them of sexism, ageism and bigotry. The council’s decision was rescinded soon afterward, and at first it seemed as if the mayor and the council had reconciled. But tensions have re-emerged with a vengeance. Councilor Neal Harkness said that he thinks the council has fallen behind on the business of the city because of what he termed a recurring procedural problem in the meetings. Belfast, he said, deserves better. Several councilors brought up a difficult interchange that happened at the Feb. 16 joint Planning Board and City Council meeting on the proposed Tractor Supply development. Harkness had raised his hand to answer a question, but Paradis did not call on him, instead saying she wanted to hear from people who were opposed to the premise. Even though no one initially raised their hand, she still did not call on the councilor. Finally, Harkness grew agitated, standing up and gathering his papers from the table. “If my participation is not welcome, I will leave the meeting,” he said. During a short back-and-forth that followed, Paradis at one point chided Harkness for interrupting her while she was speaking. “If you’d like to get up and leave, you can get up and leave,” she told him. In the end, Harkness stayed, and spoke. But the exchange was a watershed for several councilors, who described Tuesday night how strongly it had affected them. Paradis, who has said numerous times that she ran for office on an agenda of bringing every voice to the table, explained to the council on Tuesday that the joint meeting was difficult to moderate. She said she needed to clarify several things with city staff members, and that is what she was doing when Harkness “aggressively stood up” to leave, she said. Harkness said he didn’t experience it that way. Paradis said she believed the resolution was based in sexism and was inconsistent with Belfast values. She asked the council to think about their privilege, and about implicit bias. She spoke repeatedly about her disappointment that the council has not moved forward with diversity training, which she said they had agreed to last December, and apologized more than once to the public for spending so much time on the resolution. She did not seem to be moved by councilors’ complaints about her leadership or their concerns about the events of the joint meeting, calling the resolution unnecessary and unfortunate.